Maps of 10 Most Distressed Communities in the U.S. Here's a 2016 CityLab article with maps showing the 10 most distressed communities in the U.S. Chicago is included. 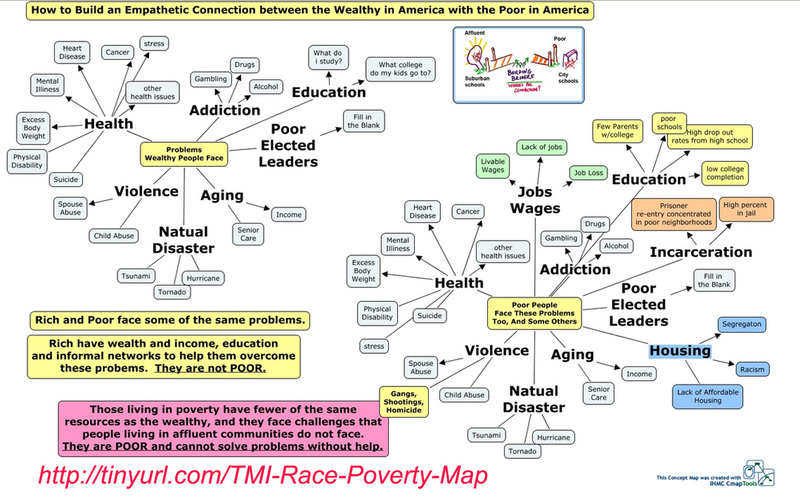 Put these maps and charts into advocacy campaigns intended to mobilize people, talent, dollars and other resources needed to help the people in these neighborhoods overcome the challenges they face. 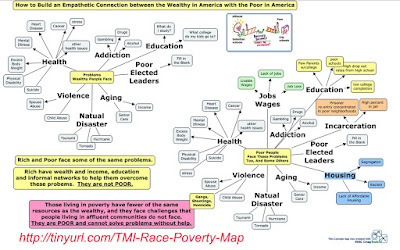 Above is a concept map illustrating the problems people in high poverty areas face. They have many of the same challenges as do people in affluent areas, but many other challenges that are not common in affluent areas. People in more affluent areas have more resources and a broader network of other people to help them overcome their challenges than do people in high poverty areas. It's for this reason that the Tutor/Mentor Connection has supported the growth of volunteer-based tutor/mentor programs that draw people from different work, education and income backgrounds into the lives of youth and families in high poverty areas. 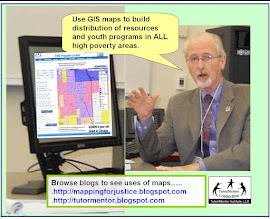 Anyone who uses this information anyone can form a study/reading and discussion group with others and use the ideas to take an on-going, and strategic role, in helping needed programs grow in one, or many, high poverty neighborhoods. If you're doing this, describe what you do on your blog, and share the link in the comment section of this blog. 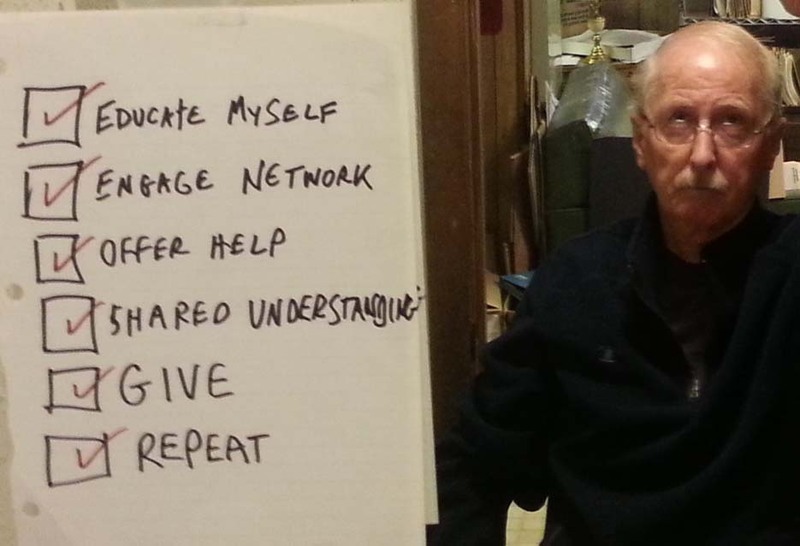 Find more articles like this on the Tutor/Mentor blog. I attended the quarterly meeting of Strengthening Chicago's Youth today at Lurie Hospital in Chicago, along with about 100 other people. The focus of the event was on "Holding Systems Accountable for Violence Prevention". Following a panel discussion breakout sessions looked for ideas about holding systems accountable. Part of that included defining what we mean by "systems" and "accountability". SCY is compiling the notes from the event and will post them on their web site. When that is available I'll update this link. To me "systems" are the various institutions who occupy space in a geographic area, such as the Chicago region, or smaller segments, such as community areas on the West or South side of Chicago, where high poverty contributes to greater levels of violence. Accountability, is what institutions and individuals do to "look in their own mirror" and say, "What have I done today with my time, talent, wealth, status, etc. to bring needed violence prevention services to the neighborhoods where I have a reason to be involved?" Holding political leaders accountable means, there is some way of knowing what they do to help their district overcome violence, and there is a voter turnout to elect, or re-elect, representatives who actually demonstrate consistent actions intended to reduce violence in their district. A while back I created the presentation shown below, and posted it in this article on the Tutor/Mentor blog. I hope you'll look at it. I hope that people in different sections of Chicago, and in other cities, will create their own versions of this, share it on their blogs, and then encourage others who should be involved, to share the presentation so it reaches a larger percent of people in the region. This is one of many strategy presentations I've posted on my web sites, blogs and platforms like Scribd. Below is an image from another presentation, which describes four concurrent strategies that I feel must be happening in order to create the change we want to see in our communities. The articles on my website, the SCY-Chicago web site, and on sites I point to from my web library, represent ideas people can use to build collaborations and solve complex problems. However, if we don't find ways to tell millions of people these ideas are available to them, too few will find them, understand them, and act upon them. Since the social sector and individual citizens don't have the millions of dollars that corporate advertisers use to draw customers to their products, services and stores, or the billions that political campaigns spend in every election cycle, we need to find other ways to draw daily attention to these ideas. That means you need to share this and other articles I and others are writing, on Twitter, Facebook, Linkedin and in your weekly Sunday School meeting. It means you need to create similar presentations, showing your own "theory of change" and "problem solving strategy" and post it on your own blog or web site. You need to follow me and each other. We need to create attention even when the story is not on the front page of the local newspaper. At the end of each day, look in your mirror, and check off the things you did to make change happen. NOTE: On Feb. 4. I posted an update to this on the Tutor/Mentor blog.